My name is Emma Gladstone and I am from Mary Esther, Florida. I am attending Birmingham-Southern College (BSC) and had the incredible opportunity to intern at the Turkey Creek Nature Preserve. I grew up in a neighborhood that was five minutes from the beach and just a short walk from acres upon acres of longleaf pine forests. I grew up with a love and appreciation for nature. This passion for the environment is what led me to become an Urban Environmental Studies major at BSC. Through this major and school, I have been able to experience some of the most incredible places in Alabama. However, the place that stands out the most is Turkey Creek. The crystal clear, blue tinted, spring fed creek is breath taking. Along with the amazing rock faces and hiking trails that show the gorgeous trees and flowers of Alabama. This preserve is home to 7 endangered/threatened species. One of which is the Vermilion Darter. This vibrant, small fish is only found at Turkey Creek and nowhere else in the world. The rich history of this piece of land is full of evidence of Native Americans, first settlers here in Pinson, and the prison that led Turkey Creek to become a preserve just 7 years ago. In my few times I visited Turkey Creek, I never learned as much as I did with interning in June and July. I have learned about all of the effort it takes to keep such a magnificent place safe and clean for people to continue to enjoy it. The hard work that is required for a non-profit is mind boggling, but incredibly rewarding. The passion the people who are involved with Turkey Creek is such an inspiration to me. To work hard for little pay, just to make a gorgeous place thrive into something better. I learned that a lot of people do not appreciate the preserve as much as others. I saw that there will be people to try and take advantage of this place in the wrong way, but those people stand short in comparison to the ones who love this place and help build it up. Turkey creek is a place that you will not find anywhere else. The cool, refreshing water on a hot summers day does not compare to a beach. The gorgeous sunflowers and brilliant fish stand out from any others. The natural rock slide at the falls is truly special, with a giant rock to climb and see the wonderful curves of the creek. The trails show off the dense trees that create a beautiful green glow in the summer time. This place will forever have an impact on my life. If you want to experience something unique and special; go out to Turkey Creek Nature Preserve. You will not be disappointed. 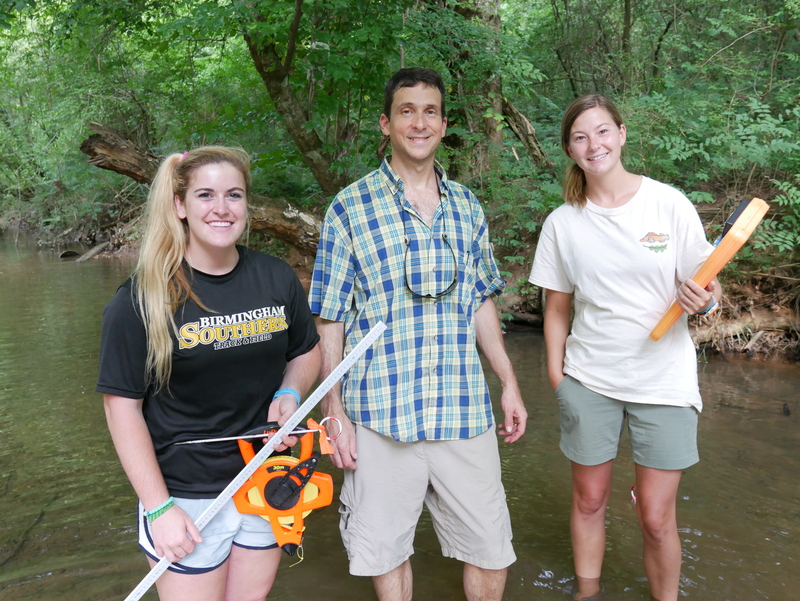 Emma assisting Birmingham-Southern Professor, Scot Duncan and his student with stream ecology research in Turkey Creek.